This week's DIY is a t-shirt DIY — which is, in case you haven't guessed, one of my favorite kinds of do-it-yourself project, because of the ubiquity of the raw materials. And this t-shirt DIY comes to you with the help of a very special guest: fashion designer Natalie Chanin, of the label Alabama Chanin. She showed me how to do the most incredible things with a needle and thread. In addition to the acclaimed Alabama Chanin collection — for which Natalie has been nominated for a Council of Fashion Designers of America award, and which you might have seen in the pages of such magazines as Vogue — Natalie Chanin runs sewing workshops and sells DIY supplies, clothing patterns, and kits on her Web site. She's also the author of three DIY books. That hands-on focus is unusual in high fashion, to say the least, which often likes to preserve as many illusions as possible about where (overseas?) and how (proprietary!) and by whom (paid?) it is made. And Alabama Chanin definitely is high fashion — its clothing can retail in the thousands of dollars. Chanin is out to challenge the idea that "fashion" is about the designer, and "sewing" and "craft" is about the home-made. As she puts it, making things needn't be viewed as a competition between the "auteurs" and the "amateurs." (This view also has a gendered dimension that is itself inherently problematic — "fashion" connoting that which is hierarchical and male, "craft" that which is humble and female.) When she started selling her patterns, she says, others in the industry told her, "You just killed your business." But sales of her collection remain robust, she says — probably because the many hours of work that go into most pieces make them difficult to truly replicate — and the DIY side of Alabama Chanin has meanwhile grown to nearly match the fashion side. Natalie Chanin lives in Florence, Alabama, where her design workshop is located (and where her clothing is made, by local seamstresses who earn a living wage in an area of the South that has been ravaged by unemployment and industry flight). But this week, when Chanin came to New York for the Makeshift conference on sustainability and DIY culture in fashion, I jumped at the chance to meet her. We drank chamomile tea and talked DIY and did DIY. I learned things. If you're like me, you believe that making things can be powerful. It's an exercise in autonomy, and it's a demonstration of thrift. I find sewing a purse, even if it takes me a week's worth of evenings (maybe because it takes me a week's worth of evenings) much more empowering, and certainly more satisfying, than I do buying one. Here's how to do the t-shirt DIY we chose. You will need, clockwise from top left: 1) A stencil. 2) A t-shirt. 3) Butcher paper, or old brown paper bags, flattened. 4) Fabric paint. 5) Sewing scissors and embroidery scissors. 6) Beads and sequins that you want to use. 7) Scrap fabric if you want to do appliqué. 8) Pins, needles, and a pincushion. 9) A Sharpie. 10) Thread. 11) Beading needles. You will also need a hairdryer, a sponge, and a plate, not pictured. To prepare your shirt for stenciling, fold a piece of brown paper to size and push it up into the shirt. This will hold the shirt flat, and prevent the fabric paint or Sharpie pen from soaking through to the back of the shirt. Click any photo to enlarge. Pour out a little fabric paint — you can buy it at any craft store, or online — and dab it on the inside hem of the shirt to test the color. Point the hairdryer at it until it sets. I decided I wanted a kind of tone-on-tone effect with gray paint on a gray shirt, so I tested two grays. One was a little too tone-on-tone, because once it dried you could hardly see it. I went with the lighter gray. Another great option if you don't want to use fabric paint? Chanin suggests using a Sharpie to color in the stencil, because they're permanent and they come in so many colors. Lay out the stencil over your shirt. Decide where you want the design to be placed. If you only want to use part of the stencil — say, if you want to place a big flower or another design element at the hem or over the bust — then put another piece of butcher paper between the unused areas of the stencil and the shirt. I'm using a stencil that is available on Alabama Chanin's Web site — you can either buy a laser-cut plastic stencil like this one, or you can download the pattern for free, enlarge it, and cut it out of a piece of plastic yourself — but there are plenty of other stencil sources out there. Chanin suggested stencil books published by Dover, which cost $1.50-$2 for a whole booklet of designs. When you've decided on your stencil placement, use glasses of water (or cans of beans, or whatever you've got that's heavy) to weight the stencil. Then pour the fabric paint into the plate and start sponging it onto the stencil. Ta-da! Chanin says that with most fabric paints, you should wait three weeks before washing the garment. Fabric paint continues curing after it dries, and the paint will live longer if you let it cure completely before getting it wet. She says you can machine-wash any fabric paint without fear, unless otherwise indicated. Use the hairdryer to speed the drying time. Once the t-shirt was dry, I repeated the stenciling on the back of the shirt. Now it's time to sew on some embellishments. You can use beads, you can do appliqué, you can sew on sequins — whatever is your wont. But first, you need to thread your needle. Natalie Chanin had some needle-threading wisdom to impart that I would like to share. First, you need to consider your needle and thread very carefully. You need thread that will be strong enough to secure some heavy elements, and you need a needle with an eye big enough to contain that thread, but small enough to pass through a tiny glass seed bead. Chanin likes Coats Button Craft thread, a strong, rigid thread with a polyester core wrapped in cotton. It's made in Mexico; there aren't many U.S. factories that make specialty threads these days. As for needles, Chanin likes Richard Hemming & Son Milliners Large-Eye Needles in size 10. The eye is totally flush with the barrel of the needle, but it's big and round and just fits a Button Craft thread. But there's more to threading your needle than just having the right equipment. Chanin told me that you should always thread the end of the thread that comes right off the spool — you shouldn't unspool a length of thread, cut it, and then push that cut end through the needle's eye. This is an old wives' tale, but it turns out it's based in physics. Any thread has torsion because it's made of many smaller fibers twisted together. When thread is rolled onto a spool, it picks up torque — meaning that when you cut it, thread is more likely to twist in one way than another. When you cut into a thread that comes off the spool, says Chanin, the fibers in that thread shrink back and twist more tightly around each other — making that cut end easier to navigate through the eye of a needle. The other end of the thread, by contrast, starts to untwist when it's cut. Always thread right off the spool. And always cut the thread at an angle, to make a sharp, twisted "point" that will go through a needle's eye with relative ease. "There's another old saying," said Chanin. "You don't thread your needle, you needle your thread." Don't take the thread to the needle. Hold the thread securely between thumb and forefinger, and bring the needle's eye down onto it. Never sew with a thread that's longer than two times the distance from your thumb to your elbow. It's not ergonomic, and a thread that's too long undergoes too much stress from the violence of pushing through your fabric repeatedly. A thread that's too long will get weak from abrasion; that weakness will affect the lifetime durability of your garment. Chanin says that at the sewing workshops she leads periodically in Florence, she always tells people that the last step to threading a needle is to work out some of the torque and torsion in the thread by stroking it repeatedly. This step, which she calls "loving the thread," leads to a less-twisty sewing thread that's also less likely to knot. And you should talk to your thread, says Chanin. While you're smoothing it with your fingers, you should tell the thread about the qualities that you want the wearer of your garment to feel when she puts it on — wisdom, peace, beauty, intelligence, confidence, however you want her to feel. Chanin says that you have to love your thread, and love your work, because sewing is time-consuming and should only be done out of love. Chanin also told a story about how to knot the thread. Big, bulky knots are a signature of Alabama Chanin clothing — because when you work primarily in cotton jersey t-shirt fabric, you need a big knot to hold your work together. (Cotton jersey is a knit, and up close, like all knits, it's riddled with little holes a small knot could slip through.) "There's a story my granddaddy told me when I was a little girl," said Chanin. He told her to pick up all the sticks she could from the yard and bring them to him. When she did, he took one stick and asked her to break it. "So I did," she said. "Then he had me pick up the whole bundle, and he asked me to break all the sticks. And of course I couldn't. He said, 'That bundle of sticks is like your family. And nothing can break it apart.' You need your family of threads to have a big, strong knot, or your work will come apart." She was wearing a floor-length skirt covered in hand-sewn appliqués in the shape of leaves; each was secured with a large knot. It had taken over a month to sew, she said. And in years of machine washings, not a leaf had come undone. I decided to sew on some sequins, using a chain stitch. Here's how you do a chain stitch: first, push up through the fabric from the wrong side. Pull the thread all the way through. Push a sequin down onto the thread. Insert the needle into the center of the sequin, back the way you just came. When you've pulled the thread almost all the way back through, leaving a little loop in the middle of the sequin, poke the tip of your needle back up through the fabric at the edge of the sequin. Catch the loop in the tip of the needle. Pull the needle all the way up and tug the stitch so it's snug. Then add another sequin, make another loop, and catch it in your next stitch. See how each subsequent sequin overlaps, and hides, the stitches in the chain? 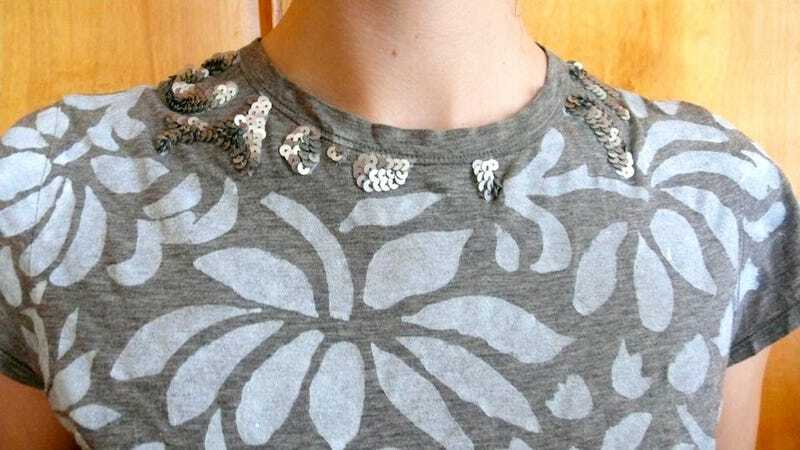 I decided to use the sequins to fill in all the areas of the pattern on the shoulders of my shirt, and to progressively fade the sequins out farther down. I like the texture of the sequins. The top part of the pattern will be super sequin-encrusted, while the bottom sections might just have a sequin or two here and there. This is about five hours' worth of sequin-sewing, and as you can see, the shirt is wearable but my sequin-encrustation plan is not quite fully realized. I think this is going to be one of those projects I come back to periodically, sewing and adding to when I feel moved. Natalie and me. I will never thread a needle again without thinking of her. Summer&apos;s coming. Couldn&apos;t you stand to have some whimsical sunglasses in your life?